This is a developing story and will be updated as more information is provided. Updated 9/1 at 9:15 p.m. – University Spokesman Joe Cardona led a community meeting Thursday to address concerns surrounding recently discovered elevated lead levels in water across campus. Aside from Rowan officials and student reporters, the meeting was attended by less than five students. “We were hoping there would be more people (at this meeting), but this is a good thing, the message is getting out,” Cardona said. Cardona detailed the water tests the university has conducted thus far, which began with preliminary tests of the water in all buildings on campus on Aug. 31, results from which are expected in seven to 10 days. Cardona said the preliminary tests could expose other problem areas, but will likely not be enough to deem any areas safe. An additional long-term comprehensive study of the water will be conducted to determine the source of lead in buildings where levels are high. The current belief is that lead “most likely is leaching into our water from older pipes, lead-based solder and plumbing fixtures on campus that contain lead,” said an email sent to students yesterday. Since the announcement Cardona has fielded approximately six phone calls from students and just one parent, he said. However, two students in attendance at the event raised concern that many of their friends were unaware about the incident or wondered how long the lead was present in the water. “It could have been going on for a long time,” Cardona said. He suggested alumnus who fear they’ve previously drank water from an affected building should contact their local family doctor. Director of Residential Learning and University Housing Travis Douglas said signs were posted alerting residents of the water issue, but was unsure if signs were posted specifically in dorm bathrooms warning residents not to drink from sinks or showers. Resident Assistants throughout buildings on campus are also yet to be comprehensively informed regarding the situation, and residents have not received fliers or personal notification, outside of emails, of the dangers of certain water supplies. Douglas exited the meeting after he made his remarks. 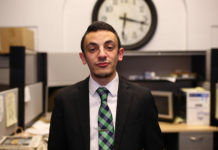 Housing hopes to make sure all students in potentially affected dorms will be supplied with a case of bottled water in coming days, though Cardona was unable to outline an action plan that would extend any further. For updates on the water situation, the university encourages people to visit its webpage at rowan.edu/waterquality, where results of the short-term and long-term tests will be posted. 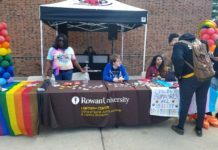 “I need your help, there is nothing to hide here,” Rowan University President Ali Houshmand said as the meeting ended. 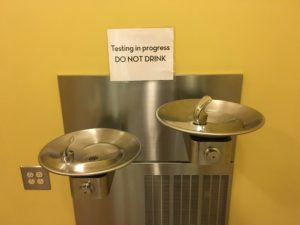 Updated 9/1 at 5:00 p.m. – One day after the university announced that tests showed several buildings on campus with high concentrations of lead in the water, some Rowan students have already begun to express their disappointment. Other students, like junior marketing major Alicia Rosato, said they think the situation exemplifies the university’s growing need to prioritize its current students over its expansion. However, so far most of the first-year students spoken to by Whit reporters stated that the announcement has not caused them much concern. Each freshman dorm feared to be affected was given a case of bottled water for students to use for hygiene and consumption until the water can be deemed safe. Another student, Curtis McDonald, a Law and Justice freshman, said that, while he’s not too worried, he carried a water bottle from his dorm when he went to the gym and the cafeteria in the morning. “My mom actually dropped off a case of water too, so now I have two cases of water sitting in my room,” McDonald said. Some fountain drink machines in the cafeteria that used water were also turned off today adorning signs that informed students to drink from jugs marked as using filtered water that was brought in overnight. Updated 8/31 at 9:33 p.m. – A community meeting will be held tomorrow, Sept. 1, at 7 p.m. in room 221 of the Student Center for anyone with additional questions or concerns about the issue. Students and community members with questions are also encouraged to email them to officeofthepresident@rowan.edu. Original – Water in multiple buildings on Rowan’s main campus has been tested and found to be above the Environmental Protection Agency’s Action Level for lead. According to an email sent to students on Wednesday evening, water from Linden Hall, Carriage House, Oak Hall, Laurel Hall, and Bole Annex was tested and found to be above the 15 parts per billion action level set by the EPA. Memorial Hall was also tested but was not found to have elevated levels. “Out of an abundance of caution, we suggest that you avoid consuming water from any buildings on campus,” the email said. Testing throughout the rest of campus is set to begin “during the next few days,” according to the email, but it could take several months to receive results from all samples, though preliminary sample results should be returned by the end of the week. 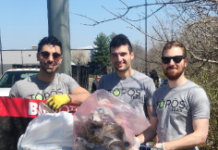 In the mean time water bottles are being distributed to all of the residence halls on campus to use for teeth brushing, cooking, and drinking. A re-examination of the water filters in the cafeteria and other locations on campus which serve food will take place as well, but water in those locations is currently safe to drink unless otherwise marked. Each dorm room in residence halls will be receiving a case of bottled drinking water from the university in coming days to be used until the water is deemed safe, said University Spokesman Joe Cardona. Because lead is not absorbed through the skin, showering, hand washing, and dish washing is still safe in these areas. Housing further from the center of campus, including the Rowan Boulevard Apartments, the Whitney Center, the International Center and the newly constructed Holly Pointe Commons are not considered to be affected by the danger of elevated lead levels, said an email sent by Assistant Vice President for Residential Learning & Inclusion Travis Douglas. According to the email, those buildings utilize Glassboro’s municipal water supplies which have been tested for lead and found to be in compliance with state and federal regulations. Residents in the affected halls will be receiving information in the coming hours regarding where and how they can pick up drinking water in their halls. The email stated that university officials had first been made of aware of an issue with the water in Linden Hall when it appeared to be discolored. Water quality tests then took place in the last month in Linden Hall, along with several of the buildings of similar age and in close proximity, which yielded the results of elevated lead in Oak Hall, Laurel Hall, Linden Hall, Carriage House, and Bole Annex. The email states that elevated levels of iron, which caused the discoloration, were found in some instances as well. The university’s email said that water from each of the campus’ 50 buildings will be tested in the coming months and that as results are provided they will be made available to the university community as well. “Should any of the results reflect elevated levels of lead we will immediately implement actions similar to those we already have taken in buildings where elevated lead levels have been found,” the email said.